Oral Examinations allow us to examine the teeth, gums, soft tissues inside and outside your mouth, as well as the functioning of the jaw. We recommend an appointment every six months to check for signs of tooth decay and remove dental plaque that you may have missed. 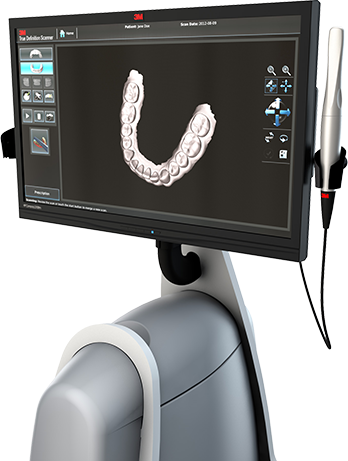 Our new 3M True Definition Scanner allows us to eliminate those annoying, gooey impressions by taking a digital scan of teeth and creating a 3D model, allowing better fit and accuracy. This scanner is used for crowns, implants, and even in Invisalign and orthodontic retainers. We also have the ability to use it for whitening trays, occlusal splints and athletic mouthguards. Last summer, Angie and Candiss were asked by 3M to become trainers for the company. They now occasionally travel around Texas and Oklahoma to help educate and integrate the technology in other dental offices.